New Jersey Governor Chris Christie and I both had the same idea over the July 4th holiday weekend. 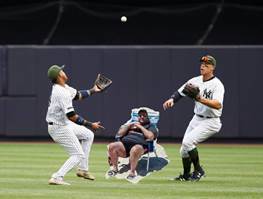 Taking advantage of the warm weather and a few days off from work, I packed up a towel and a new book and booked it to the North Shore; Governor Christie grabbed a chair and some SPF and headed straight to the ocean. I had a wonderful day, and I suspect he did too. The only issue? At the end of the day, he was a meme. 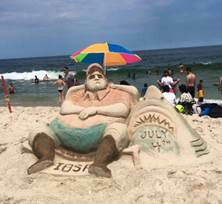 As everyone pretty much knows by now, two days before Christie kicked back and relaxed, he closed state beaches to the public following a government shutdown. So when pictures of him enjoying his empty expanse of shoreline quickly surfaced, photoshoppers couldn’t help themselves. He made his way to professional sporting events. He even ended up on other beaches (in sandcastle form).